Macao Government Tourism Office (MGTO) will present the “Celebrations of the 20th Anniversary of the Establishment of the Macao Special Administrative Region – Parade for Celebration of the Year of the Pig”, the mega celebration event, on the 3rd day (7 February) and 6th day (10 February) of Lunar New Year to celebrate the joyful occasion with residents and visitors. The event features a range of spectacular activities from float parade, large-scale performances, fireworks display and float exhibition to Favourite Parade Float Voting. The event will be the first highlight presented by MGTO to celebrate the 20th Anniversary of the Establishment of the Macao Special Administrative Region. 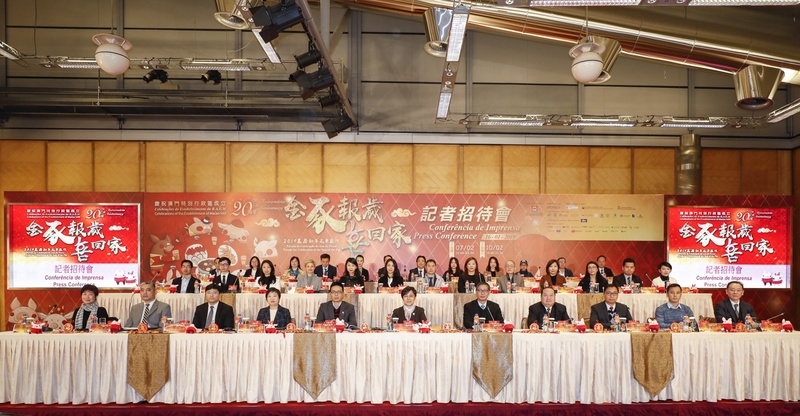 The “Celebrations of the 20th Anniversary of the Establishment of the Macao Special Administrative Region – Parade for Celebration of the Year of the Pig” (the “Parade”) is organized by MGTO and co-organized by Municipal Affairs Bureau, Cultural Affairs Bureau and Sports Bureau. A press conference for the event was held today (16 January). MGTO Director Maria Helena de Senna Fernandes, MGTO Deputy Director Cheng Wai Tong, Assistant Director of Asia Tourism Exchange Center, Li Wen Pei, Vice President of Cultural Affairs Bureau, Chan Kai Chon, Head of Department of Cultural and Recreational Affairs and Civic Education of Municipal Affairs Bureau, Patsy Ko Pui San, and Head of Sports Facilities Management Department of Sports Bureau, Ho Wa, were present in the press conference together with representatives of the supporting and sponsoring entities. For the upcoming Chinese New Year, MGTO has meticulously prepared a series of celebrations for residents and visitors. As the major highlight, the “Parade for Celebration of the Year of the Pig” will be staged on the 3rd day and 6th day of Lunar New Year in the central and northern districts. Spiced with gastronomic elements once again, the Parade will be themed as “Return home for Chinese New Year”. 18 floats will represent various Chinese New Year dishes that symbolize auspicious wishes, showering abundant blessings on residents and visitors while showing the glamour of Macao’s gastronomic and traditional culture to the world. In speaking at the press conference, Director Senna Fernandes stated that 2019 is the year to welcome a major milestone, the 20th Anniversary of the Establishment of the Macao Special Administrative Region. Macao Government Tourism Office will partner with other entities to stage an array of annual mega events in joyful celebration with residents and visitors. 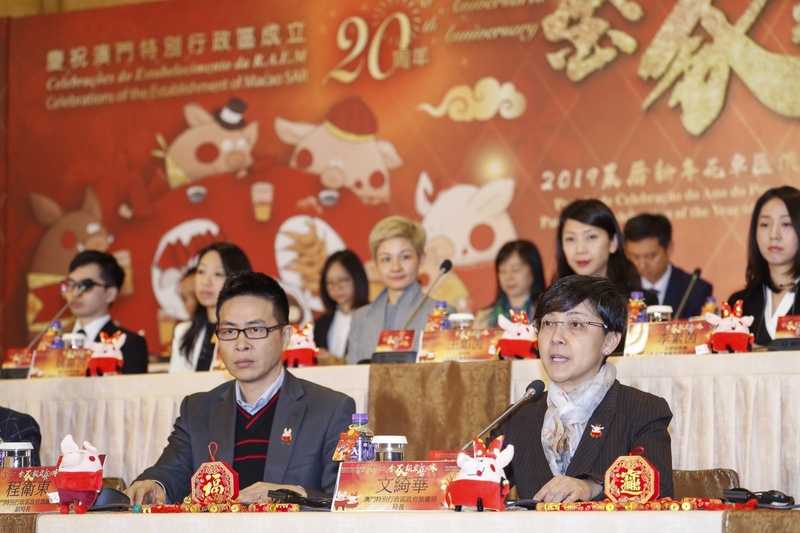 The “Parade for Celebration of the Year of the Pig” will be MGTO’s first highlight of celebrations of the 20th Anniversary of the Establishment of the Macao Special Administrative Region. She stated that the Parade for Celebration of Chinese New Year has gradually developed into one of Macao’s signature festive events. MGTO has kept enhancing both hardware and software facilities of the Parade, and deepening the level of enjoyment among spectators so that the Parade will gain wider popularity as a more spectacular event each year. According to the effectiveness evaluation conducted by a research institution on the Parade last year, the level of awareness and overall level of satisfaction both reached an excellent level. With the heartening result, MGTO will continue to augment the effectiveness of the event in order to draw visitations from a wider diversity of source markets and enhance the level of residents’ participation. For the event on the 3rd day of Lunar New Year, there will be a float parade, procession of performance groups and fireworks display. Joined by a total of 32 local and international performance groups, 18 dazzling floats filled with blessings will set off from Sai Van Lake Square before Macau Tower at 8 p.m., march along Avenida Dr. Sun Yat-Sen on Macao Peninsula until the destination at Macao Science Center. Starting from 5:30 p.m., warm-up performances will take place at intervals at designated performance zones. Bob Lam, Harriet Yeung and Germano Guilherme will be the emcees at Sai Van Lake Square while Stephen Chan, Kevin Cheng and Chan U Ian will be the emcees at designated performance zones. Hong Kong and Macao singers including MC Jin, Terence Chui, Vivian Chan and Germano Guilherme will deliver their fantastic performances, followed by a 15-minute fireworks display at 9:45 p.m., ready to give spectators a lively and joyful evening on the 3rd day of Lunar New Year. Spectator stands will be set up at Sai Van Lake Square (“Family Reunion”), the front square of Rua da Torre de Macau (“Fortune Treasure Ship”), the front square of Kun Iam Ecumenical Centre (“Golden Palace”) and the roundabout in front of Macao Science Center (“The Blessed Land”). For the convenience of residents and visitors, MGTO will operate free shuttle bus service around five routes between event locations and various districts on Macao Peninsula, Taipa and Coloane. Starting from 8 p.m. on the night, MGTO will live broadcast the Parade on LED screens set up at multiple locations for more people to enjoy the whole Parade. TDM will produce and broadcast a pre-event TV program to promote the Parade. In addition, TDM and Macao Cable TV will live broadcast the Parade on the 3rd day of Lunar New Year and record the Parade on the 6th day of Lunar New Year for subsequent broadcast; a feature TV program about the Parade on the 3rd day of Lunar New Year will also be broadcast on TVB Jade Channel and TVB Finance & Information channel in Hong Kong at 10:30 p.m. on 16 February and 1:30 p.m. on 17 February respectively. Following that, TVB Satellite TV will broadcast the respective program in different parts of the world including Australia, Canada, Indonesia, Malaysia, New Zealand, Singapore, the United Kingdom, the United States, Europe and Mainland China at different periods. There will be another float parade and finale show of cultural performances on the 6th day of Lunar New Year. The float parade will commence with a kick-off ceremony at Rua Norte do Patane at 8 p.m., with Germano Guilherme, Stephen Chan and Renee Li as the emcees. 18 floats will march along Avenida do Conselheiro Borja, Estrada do Arco, Estrada da Areia Preta, Avenida de Venceslau de Morais, Rua Quatro do Bairro da Areia Preta, Avenida da Longevidade, Rua do Mercado de Iao Hon until the finishing point at Iao Hon Market Garden, where artists and singers from Macao and Hong Kong including Raymond Cho will dazzle the finale show, with Bob Lam being the emcee. 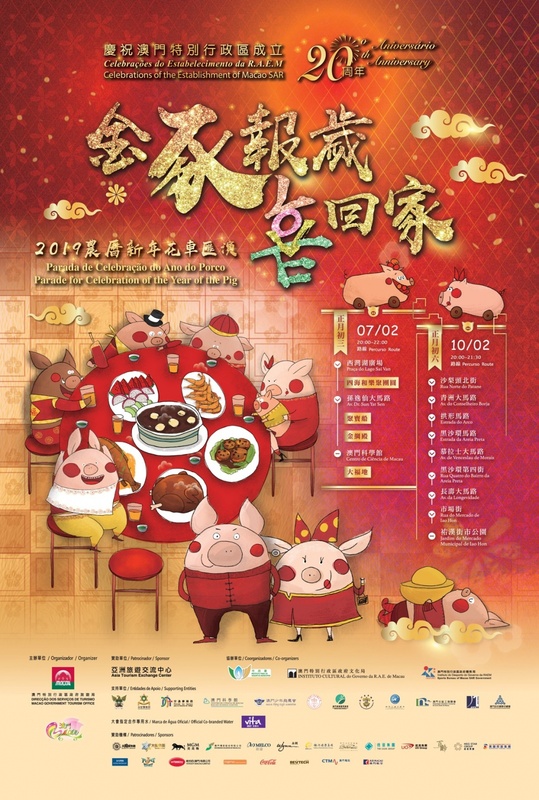 By scanning QR codes on the floats, residents and visitors can access the voting platform for the activity “Favourite Parade Float Voting”, vote for their favorite floats and submit their personal information, to enter the grand lucky draw for chances to win attractive prizes including pure gold pig ornament. 18 splendid floats are presented by the following entities: Asia Tourism Exchange Center, Macao Government Tourism Office, Municipal Affairs Bureau, Cultural Affairs Bureau, Sports Bureau, Suncity Group, David Group, MGM, Sociedade de Jogos de Macao, S.A., Melco Resorts & Entertainment Limited, Wynn Macau, Limited, Galaxy Entertainment Group, Sands Resorts Macao, Tak Chun Group, UO Group, Parry Group, Meg-Star Group and Multinational (Holdings) Group. 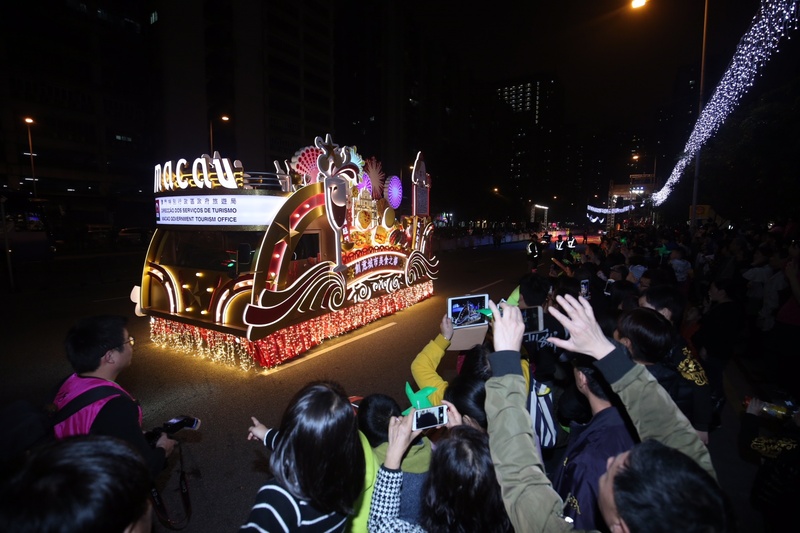 The splendid floats will be showcased at the seafront of Macao Science Center from 7 February (10 p.m.) to 10 February (5 p.m.), and following that, on display at Tap Seac Square from 10 February (10 p.m.) until 17 February (6 p.m.). Local residents and visitors can freely enjoy the sight of illuminated floats from 6 p.m. to 10 p.m. during the aforementioned periods (time schedule will be adjusted on 7 February, 10 February and 17 February because of the Parade).